Here is all you need to know about the UEFA Champions League 2018-19 matchday 5 schedules. The UEFA Champions League returns this Tuesday for its penultimate set of group stage matches. With qualification to the round of 16 at stake and the elusive group toppers spot, the latest edition of matches in the world’s biggest international club tournament are set to be absolute thrillers, bringing to our screens a subliminal display of football. Coming back to UEFA Champions League 2018-19 matchday 5 schedules, starting Wednesday, the League will treat us to some absolute belters with some of the world’s best clubs sweating it out on the pitch. Form Lyon Vs Manchester City and Roma Vs Real Madrid on Wednesday, to PSG Vs Liverpool and Inter Milan Vs Tottenham, matchday 5 promises to keep you on the edge of your seats with these humdingers. The Champions League will begin on the 27th, Tuesday at 11:25 pm and go on till the 29th, Thursday with the last set of matches kicking off at 1:30 pm on the day. Bringing to India an unparalleled sports viewing experience the Sony Network in the official broadcaster of the tournament in the country. The matches will be telecasted live on Sony Ten 1, 2, 3, Six/HD. Visit this page and our Twitter and Facebook feed for all live scores from matchday 5 of the Champions League. 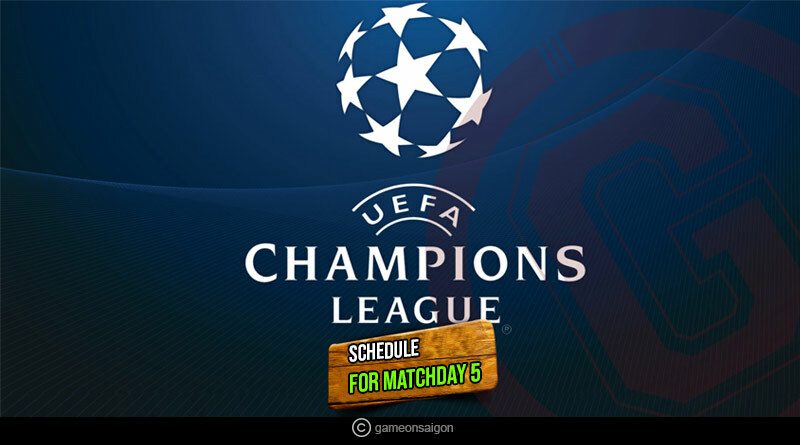 For more details on UEFA Champions League 2018-19 matchday 5 schedules and related updates, like and subscribe to tentaran.com.